In the previous two posts I compared Usain Bolt and Carl Lewis as 100m and 200m sprinters. For that comparison I used as a source a website with all time best performances in track and field (maintained by Peter Larsson). 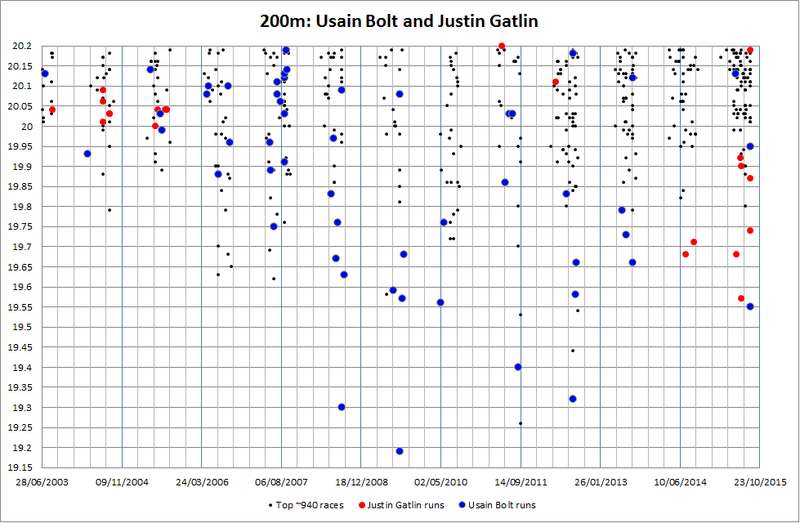 I will use the same source to make a more relevant comparison nowadays: Usain Bolt and Justlin Gatlin, both in 100m and 200m. 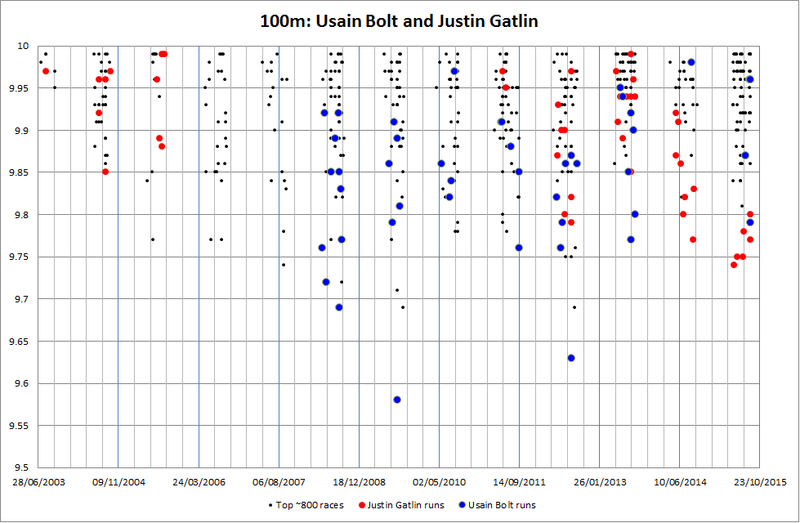 Best ever ~800 100m times, focus on Usain Bolt and Justin Gatlin. Best ever ~950 200m times, focus on Usain Bolt and Justin Gatlin. You can see in both graphics why there was so much attention in the races of this summer Beijing World Championship and expectation with the possibility of Bolt being defeated by Gatlin. 2014 wasn’t a good year for Bolt due to injuries. Gatlin ran more often and faster that year. The year of 2015 had started in the same way, with Gatlin running more often and faster, to the point of beating his personal bests in both 100m and 200m (twice). The best 5 times in 100m of the year belong to Gatlin, yet the 6th best time made Bolt the World Champion. Of the best 4 times in 200m of the year, 3 belong to Gatlin, yet the Bolt managed the best time (better than Gatlin’s personal best) on the final and that made Bolt the World Champion. Note: the times included here exclude wind-aided races and times excluded due to doping.